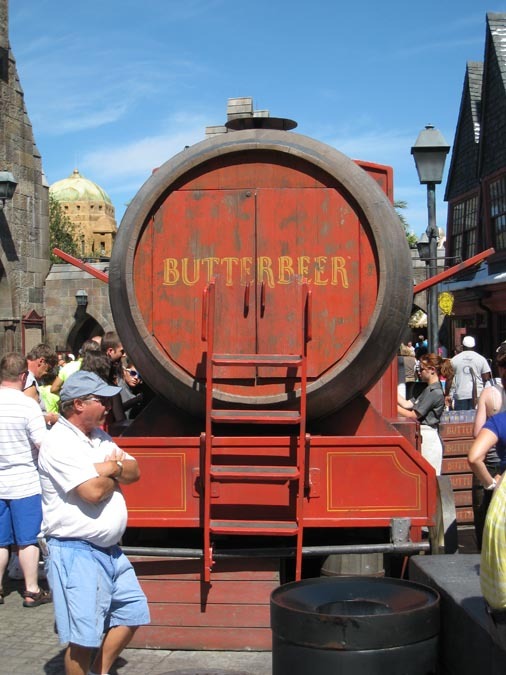 If you are curious about butterbeer here is a recipe so you don’t have to go all the way to Hogsmeade to pick one up. It isn’t officially sanctioned and I haven’t tried it yet but others who have say it is pretty close to the real thing. Combine brown sugar and water in saucepan over medium heat. Bring to gentle boil, stir often, cook until mixture reaches 240 F.
Stir in butter, salt, vinegar and ¼ cup heavy cream. Allow mixture to cool to room temp. In a medium bowl, combine 2 tablespoons of mixture with remaining ½ cup heavy cream. Use electric mixer to beat until just thickened (not completely whipped). About 2-3 min. Divide mixture between 4 large glasses (~ ¼ cup in each). Add ¼ cup cream soda and stir to combine. Fill each glass nearly to the top with cream soda.